Born in 1949, Erdoğan Ildız was brought up in a family of merchants and military officers. After finishing elementary school in his hometown Malatya, he moved to Istanbul and graduated successfully from Paşakapısı Secondary School, Haydarpaşa High School and Institute of Press and Public Relations at the faculty of Economics . During this period he took two years off and travelled through Europe to improve his foreign languages. He, then attended the Faculty of German Philology as he finished at the faculty of Press and Public Relations. 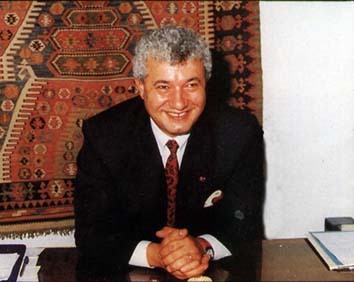 Having dealt with many different branches of entrepreneurships since very young ages, Mr. Ildız during his education, became interested in all aspects of carpets. He established Mehmet's Place in the Grand Bazaar as a carpet dealer. During this period, he met and married his dutch wife Annelies. He, then expanded by establishing warehouses in Holland, Belgium and Austria in 1980. The activity in Turkey grew to include production, wholesaling and exporting of carpets. These activities were carried out under " ERA HALICILIK A.Ş. " which was established in 1982. In 1985, he established the one and only Carpet Farm of the world, namely ILDIZ CARPET FARM. Then the TRIBAL ART® retail chain was established with international outlets. After 1990 ventures in tourism and construction were added to the portfolio. He serves as President of Turkish Carpet Foundation and as Vice President of the Turkish Carpet Exporters Association Mr. Ildız speaks turkish, english, dutch and german. He is married, with two children, İskender and Esma. He has published a number of articles concerned with carpets and marketing. He is also preparing to publish his life philosophy and working methods in a book named " COME " and establish a "School of Management " based on it .